Echinocactus grusonii, commonly known as Golden Barrel Cactus, gets its common name from its barrel-like shape. It typically reaches 12 to 24 inches (30 to 60 cm) in diameter and up to 36 inches (90 cm) in height. It is fairly quick growing at first, then the growth rate slows right down. So you can expect to wait about 10 years for the cactus to reach 10 inches (25 cm) in diameter. 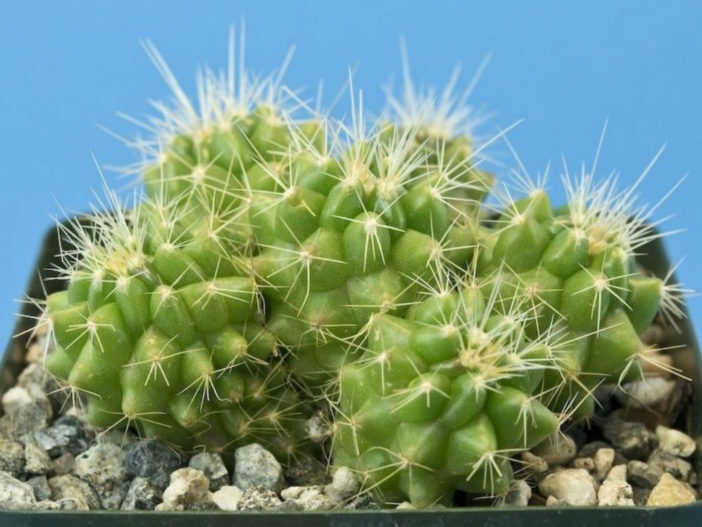 You can sow Golden Barrel Cactus seeds outdoors in warm climates, but sowing them indoors is easier and will result in a higher germination rate. Expect the seeds to germinate in one to two months. 1. Soak Golden Barrel Cactus seeds overnight in room-temperature water. Soaking seeds will help increase germination rates. 2. Fill a seed tray three-fourths of the way with slightly moist potting medium made with 1 part sand and 1 part high-quality potting soil. 3. Scatter two or three seeds per seed compartment on top of the soil. Then, cover the seeds lightly with a thin layer of sand. 4. Slip the seed tray into a plastic bag and tie it closed with a twist tie. Place the tray in a bright area, but out of direct sunlight, that is between 70 and 80 degrees Fahrenheit (21 and 27 degrees Celsius). 5. Keep the soil slightly moist until germination. Spraying the soil with a mister or spray bottle, rather than watering it from the top, will help prevent the soil and seeds from becoming too wet. After the seedlings emerge, you can take off the bag and set the tray into a sunny area until they are several inches tall and large enough to transplant to a larger container.